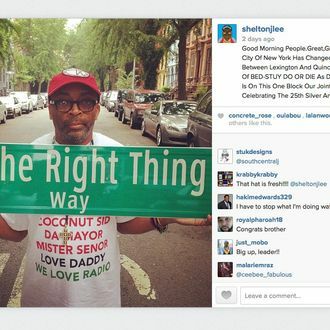 Although he no longer lives in the borough, anti-gentrification spokesperson Spike Lee insists, “Brooklyn is still going to be inside of me.” And he inside of it: Lee’s Do the Right Thing may be immortalized in true NYC-style — with a street sign. Brooklyn Community Board 3 has voted to approve renaming the Bed-Stuy block of Stuyvesant Avenue between Lexington Avenue and Quincy Street, where the movie was filmed, “Do the Right Thing” Way, in time for its 25th anniversary. The City Council has the final say, and it could be tough. “It’s a bit complicated, because the City Council’s standards for co-naming focus on people and organizations, not works of art,” the neighborhood’s representative told DNA Info. But Lee showed up at the community board meeting for the vote and seems to already have a sign ready to go, just in case.